I love to take pictures of ads. 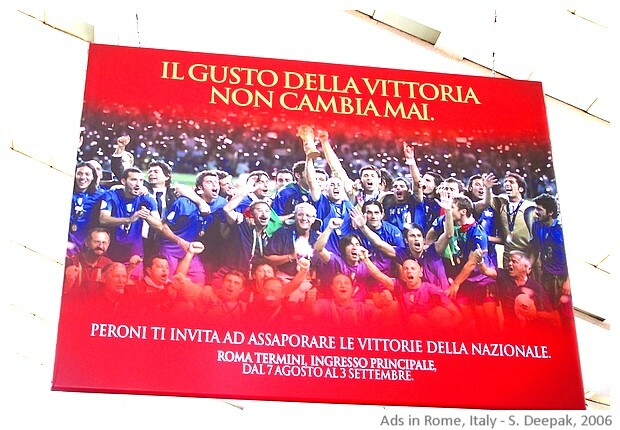 While looking at my folder of pictures from Rome, I suddenly realised I have a nice collection of some ad-pics. So here is a selection for you. 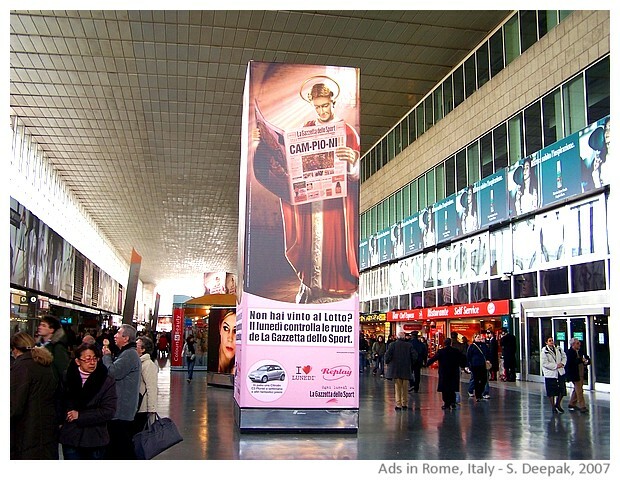 It seems that the old monuments in the centre of Rome, are wonderful places for advertising. Since tickets don't seem to generate enough income, rennovation gives the opportunity to cover up the monument, and use it for placing ads and earning money. 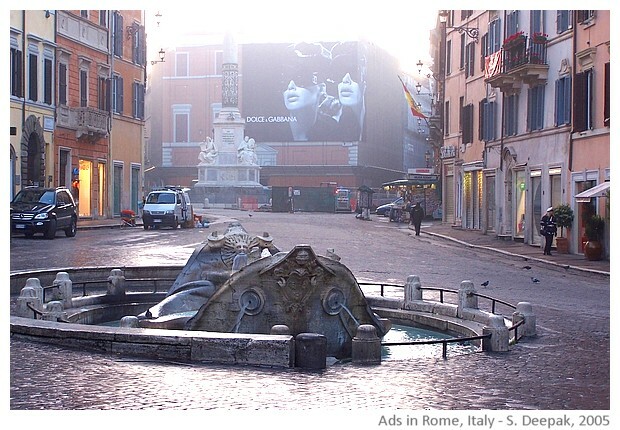 Rome municipality is discussing what to do about these never-ending rennovations around old monuments. 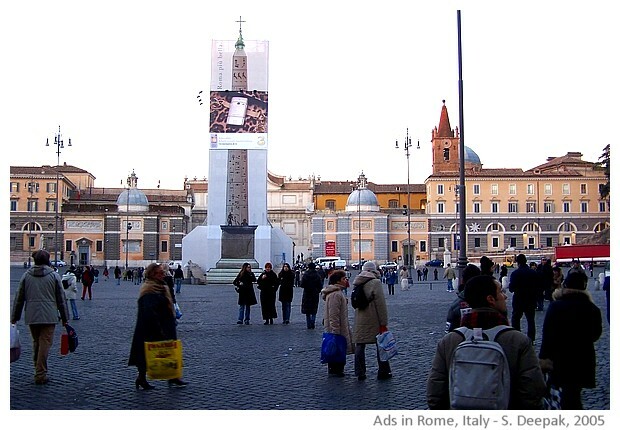 The image below shows the advertisement placed around the Egyptian obelisk in Piazza del Popolo in Rome. This is one of the most beautiful squares of Rome. 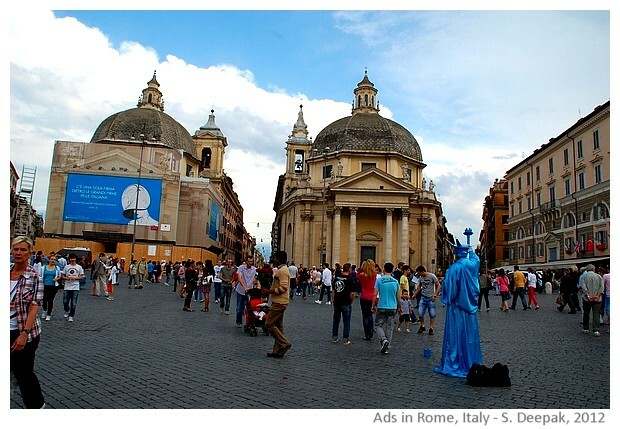 The next image is also from the same Piazza del Popolo square, showing ads on one of the churches, closed for rennovation. The Spanish Steps near Piazza del Popolo is another favourite tourist stop with thousands of persons passing hours sitting here and admiring this beautiful square with the sunken boat fountain. Thus, big brand names put their ads in the areas surroudning it. 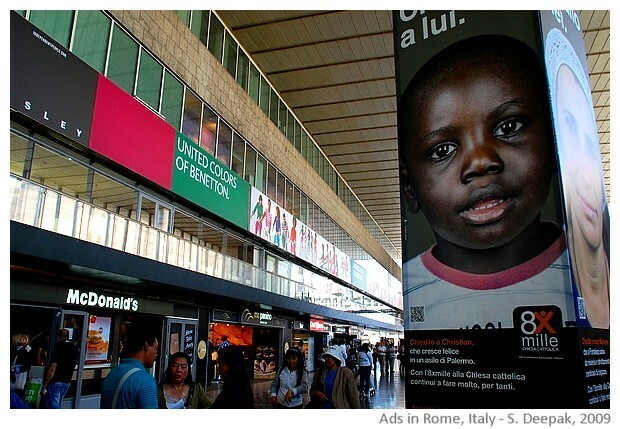 Rome also hosts one of the U.N. organisations - the Food and Agriculture Organisation (FAO). 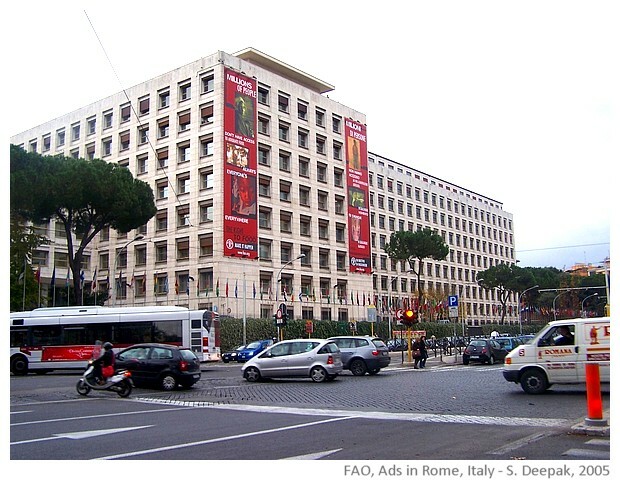 Usually the FAO building presents socially useful ads, as shown in the image below. 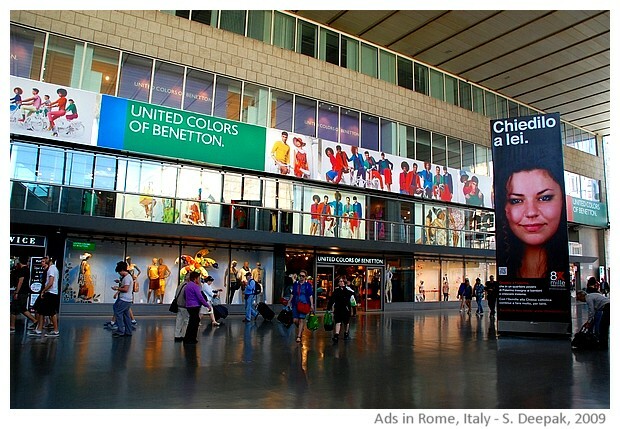 Termini railway station, the main railway station of Rome, is a popular site for ads because so many persons pass from here every day. 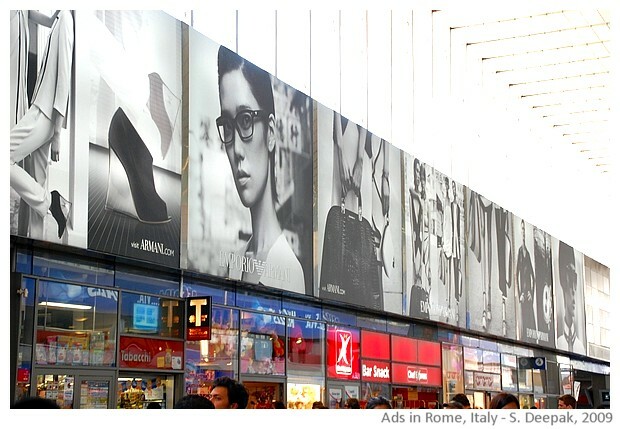 Often the advertisements placed here are huge, since the railway station has very high roofs. 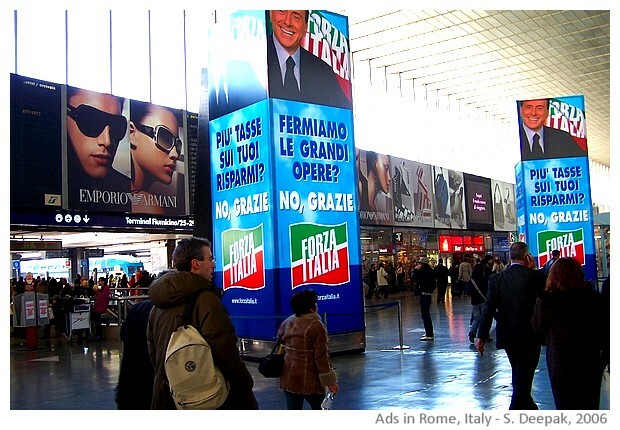 Here is a sample of ads from the Termini Railway station.